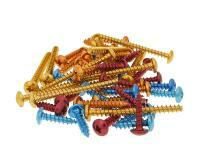 Below you will find a wide selection of screws that fit all your needs. European pre-2002 brands such as Aprilia, Beta, Benelli, Derbi, Italjet, Malaguti 50cc carry a diverse set of sizes in M6 please measure before ordering fairing screws. Post 2002 models in the USA such as Adly, Andretti, CPI, ModCycles, United Motors, Bintelli, Wolf Scooters, Gorilla MotorWorks, Genuine Scooters, PGO, Puma Cycles, Lance, Alliance Powersports, Kinroad, Redstreak Motors, CF Moto, Wangye, Wussi, Diamo, Tomos, Strada, Terminator, TNG, Twist and Go, KPI, Kee Perception Industries, TGB, Taiwan Golden Bee, SUNL, Roketa, Tao Tao, Peace Motorsports, Schwinn, Spigaly, Loncin, Jonway, Avanti, Powersports Factory, Pep Boys Baja Motorsports, Longbo,Tank, JMStar, ZNEN, Xtreem, QJ, Vento tend to be shorter screws. We have a full selection of both M5 and M6 in universal scooter part sizes 20, 30, 40, 50 in length. Please measure original set before ordering. Racing Planet carries a wide selection of Universal Vicma Scooter and Moped Parts Anodized Custom Screws. Known in Europe in the motorcycle parts scene for custom and everyday items. The VICMA Scooter and Moped Parts range offers a large selection of universal fitting items that you will be sure to use to enhance your riding experience. From everyday engine chrome items to plastic mirror accessories for the exterior of your scooter. Racing Planet USA carries a full lineup of Vicma parts for your moped and scooter.